A report caught my eye recently. It was about a village in the Indian state of Maharashtra where the residents have been guarding a scarce commodity — water. Every night, men and women stand around an elevated percolation tank, their only source of water. They take turns and volunteer for different shifts to prevent water theft by farmers who need the water for irrigation. The villagers decided to take matters into their own hands after their complaints to the relevant authorities were ignored. They say water theft usually takes place at night when the power supply is restored after hours of load shedding. During the day, when the adults go to work, young girls and boys take their turn. Their job is to alert others if an attempt is made to draw water from this tank using electric motors. Living in cities where we are more or less assured of a constant supply of water it is difficult to imagine the stress of being vulnerable to the vagaries of Nature. In many places, women trek miles to fetch water, balancing pots on their heads and hips. It might seem picturesque as seen in Bollywood movies but it is anything but. A poor monsoon can lead to a drought-like situation and some of these villagers recall a drought several decades ago which resulted in loss of lives. As I go for my morning walk, I see many women washing down driveways with buckets of water, which seeps on to the road, forcing me to hasten my step to avoid the resultant puddles. I have never understood this practice. 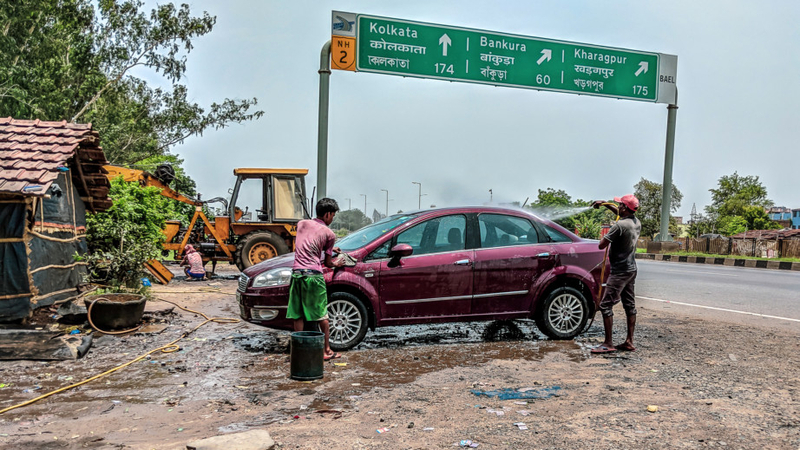 If it is an attempt to make the dust settle down, it is a thankless effort as the passing traffic will soon kick up some more. This, to me, is sheer wastage of water. You might ask why there is so much traffic in a residential area. Well, these are vehicles trying to avoid congestion on main roads by taking these bylanes! Growing up and living in army cantonments meant there was no dearth of water and yet we were never allowed to misuse this precious commodity. After my father retired and we moved into our own house, we realised that we would have to use this sparingly as the reservoirs released water to houses for a specific number of hours. If there was a power cut, that meant no water. As soon as the notice arrived home from the residential society office, my mum went into panic mode. Buckets in the bathrooms and every available vessel in the kitchen were filled in a frenzy of activity in an effort to beat the clock. Needless to say, my mum was preparing for a drought-like situation and she was making sure we would have enough water to tide us over. Amused by her gathering of pots and pans for storage, we children would rush to her with soup spoons to fill. Let me tell you she was not amused. Once the crisis was over, the precious water was used to water her plants. I think her panic was triggered by the thought of her garden turning sere if it were deprived of this life-giving liquid. Huge drums and an outdoor tank were kept filled in case of just such an emergency. I fear I have inherited this sense of doom from my mum. When I lived in Dubai and my watchman informed me that there would be no water for so many hours as the overhead tanks were to be cleaned, I went out and bought an assortment of buckets to ensure I didn’t run short. Obviously, I had learnt a lesson from my mum to be prepared for any eventuality even if I later spent a lot of time emptying these containers into the bathtub as there was no garden around.